Finally managed to get to The Farnes. The Farne Islands are a small group of Islands off the coast of Northumberland. They are the summer breeding grounds of many seabirds. The weather was wet and cloudy this morning but the sea was calm and it was our last day so we had to go. We caught the boar from Seahouses. The boat chugged out to Staple island where we nosed up into a cove surrounded by guillemots sitting on rock painted paint with their droppings. Along with 60 other people from our boat we stepped nervously off the boat onto the shore and slipped and slid our way up the path. It was only a small island and there were only certain areas that we were allowed on. Along the paths, female eider ducks sat disconcertingly around on their eggs ignoring everyone who went past. The guillemots sat in huddled crowds on the edge of the cliffs. Every now and then you can spot a razorbill. They stand around with the guillemots trying to blend in but their beaks are slightly different and they are easy to see once you get your eye in. 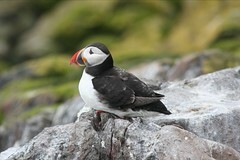 Then there are puffins. They come ashore to breed and lay their eggs in burrows like rabbits. They fly busily around sorting out nests and generally being busy bodies. I tried photographing them in flight but they are very fast. The only way is to latch on to them as they appear over the horizon and follow their movement. You feel like a gunner shooting enemy aircraft (Not). In the end I found it easier to watch them stand on a bank and wait until they took to flight. They seem to throw themselves off the grass with arms and flippers outstretched before taking to the air. Back to the boats and we cruised around to the Inner Farnes. A slightly larger island completely taken over by Arctic Terns who nest everywhere. They even nest by the path and in one case – on the path. They get pretty angry at all the tourists coming ashore and scream and shout at them. They even try to attack your head. There are good views down some cliff stacks with kittiwakes and more guillemots. There were loads of puffins and a group of Sandwich terns – black beaks. The Arctic terns have red beaks and there are some Common Terns although the Arctics are more common on The Farnes. We managed to spot one Roseate Tern on the beach. It’s a great place to experience sea birds in the raw. Half term week is not the best week to go as it’s so busy and it was difficult to get that lost in the wilds feeling with hundreds of tourists stamping over you, making inane comments and using their mobile phones.